MythTV is a software project that's so staggeringly complex and supremely capable that we could write a 12-volume encyclopaedia on its use that would still need bi-annual updates. But the software is only half the story. You may start out using your ordinary desktop machine for MythTV experimentation, but as soon as you get hooked, you're going to want some custom-built kit to put next to your television set. The problem is that not only do you have to run the usual gauntlet of Linux compatibility, you've also got to consider hardware that works well with MythTV. When you combine this with a requirement for a discreet, quiet case that can fit enough processing power to record and playback multiple television streams, you've got a puzzle almost as complex as the software. And it's a puzzle that we're attempting to solve here, as we pick out the best and most cost-effective components we can find to build the ultimate MythTV box. MythTV's functionality is split into a front-end and a back-end process. The front-end is far less CPU-hungry, and is responsible for displaying video. The back-end eats resources as it makes multiple recordings and manages your media resources, while sending video to each front-end on your network. In an advanced setup, both of these processes would run on different machines. This would enable you to have a quiet, low-power device next to the television, and a larger server-type machine secreted somewhere where you can't see or hear it. But this configuration is costly and complicated. Fortunately, you can also run the front-end and the back-end on the same machine, and that's what we're going to do. The trick is getting the balance right. The best place to start is with the case. Its size and capabilities define which other components you can and can't use, and unfortunately, getting your box to be small and neat is difficult. The smaller your case, the more expensive the bits you put inside them become, and the harder it is to fit everything in. Your case choices are going to affect what can and can't go inside them. You could opt for a diminutive dual-core Intel Atom machine, for example. But these are still relatively poor performers when compared with a standard desktop. At the moment, the best option is still to use a full-fat processor specification, and to get that into a box you can sit next to your television, you need the case equivalent of a Victorian corset. These 'corset' cases are common enough that they've spawned their own genre – the HTPC (Home Theatre PC). Each HTPC attempts to cram as much hardware as possible into a box that wouldn't look out of place next to a Hi-Fi, Blu-Ray player or games console. Some will offer an LCD display, or a remote control. But you will always have to trade expansion potential against size. The smaller your case, the less flexible it's going to be. Getting that compromise right is the first difficult decision you need to make. We went for a Lian Li PC-C37. This is a matt black aluminium case that measures only 9.4cm high, 43.5cm wide and 27.8cm deep. That's bigger than the average set-top unit you buy on the high street, but it's a lot smaller than the average PC. The height is also going to affect which expansion cards you can fit, as full size cards are too tall for the Lian Li case. A PCI Express riser, for fitting a full-size card at a right angle, is included with our box, but that still limits you to a single expansion. This may limit your options if you want to use a full-size graphics card and an internal television card at the same time. The front panel is very sparse, with only audio, USB and FireWire connectors placed in the middle for convenience. 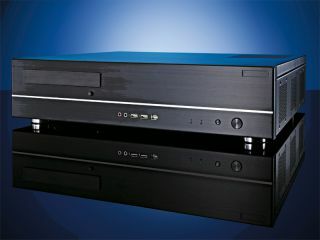 A 5.25-inch optical drive bay slots into the top right of the panel, and there's room for two 3.5-inch drives within. The vital thing to get right when buying a case is that it fits the motherboard you want to use. These come in several different form factors, from the standard-size ATX, used by most desktop and server machines, to mini, nano and micro ITX boards used within Apple-TV size computers. You also need to make sure your case includes a suitable power supply for your motherboard. These are rated according to the number of watts they can output. How much you need depends on how much you're going to plug in. We'd suggest a minimum of 300 watts. But if you know your consumption is going to be less, 200-watt PSUs are quieter and cheaper.